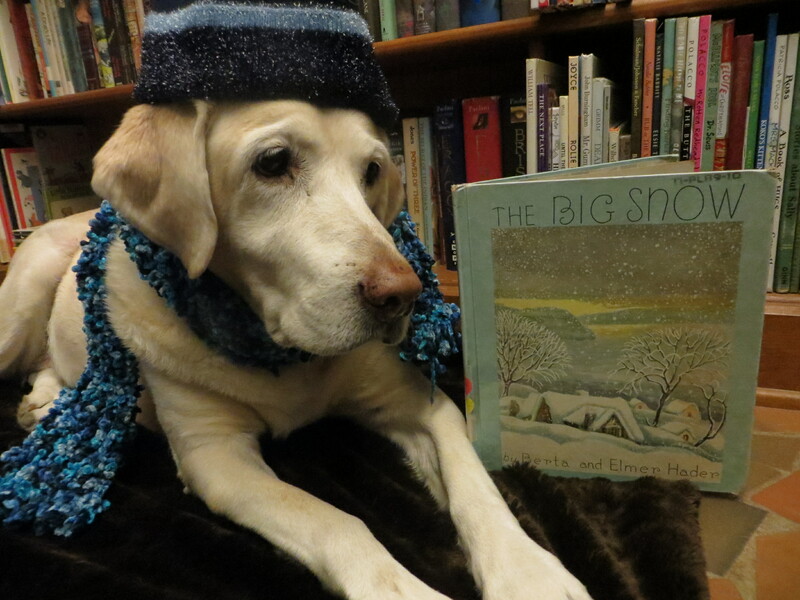 This is Perfect Picture Book Friday as declared by Susanna Leonard Hill! 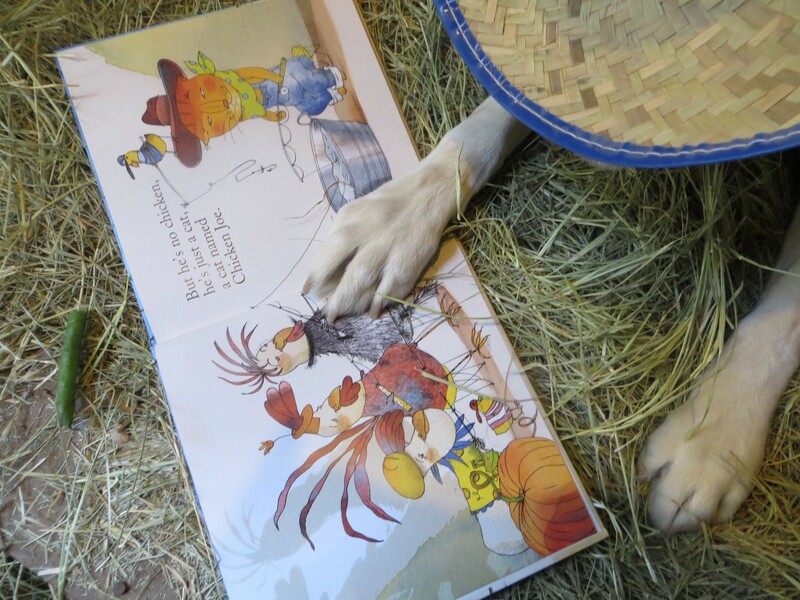 The day that lots of fabulous Picture Books come to light. I found a truly Perfect one at our school library. The school library isn’t really big, but they sure have some fantastic books on their shelves! 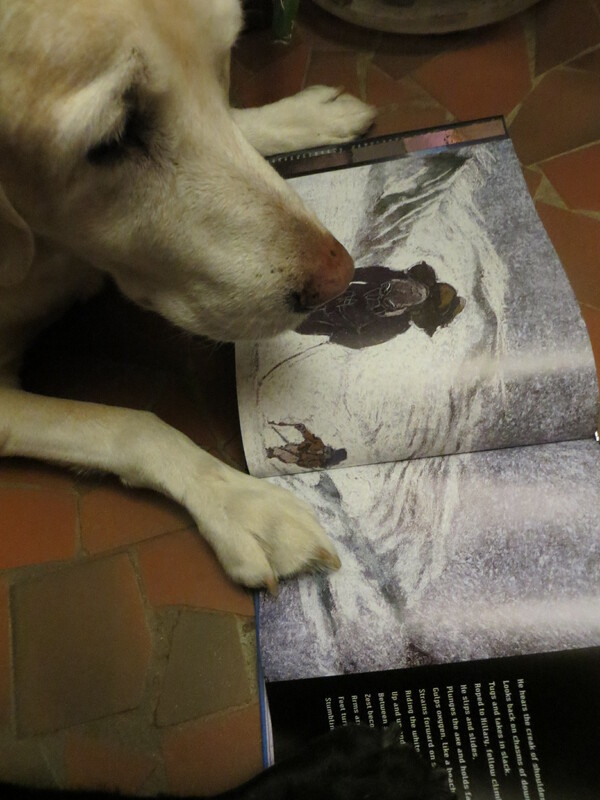 Tiger of the Snows is one of these books. It’s about mountain climbing. I’ve climbed a few mountains in my day, but nothing like this mountain! Whew!! Tiger of the Snows, Tenzing Norgay: The boy whose dream was Everest, is a biography about the sherpa, Tenzing Norgay who was part of the team to first reach the top of Mt Everest. He and New Zealander, Edmund Hillary, are quite famous for this feat. This book was written by Robert Burleigh and illustrated exquisitely by Ed Young. It is suitable for ages 7 and up. I think that kids from 4th grade and up would appreciate the story most. The story is a beautiful ode to a remarkable man and his love and passion for a formidable mountain. Tenzing grew up in the Himalayas in the shadow of the great Mt Everest. He tended his fathers yaks and dreamed of the mountain. He ran away from home and became a mountain carrier so that he could learn the secrets of the mountain. Then he became a sherpa, guiding people on mountain trails. On May 29, 1953, along with Edmund Hillary, he stepped onto the top of the mountain and the top of the world and reached the pinnacle of his dreams. The sing song verse of Mr Burleigh lets you feel the cold and the danger of every step they take. And the artwork shows the immensity of the mountain and incredibly harsh conditions that these tiny men faced. The art and words together paint a beautiful picture. I LOVE this book! It makes me want to find out more about these incredible men. 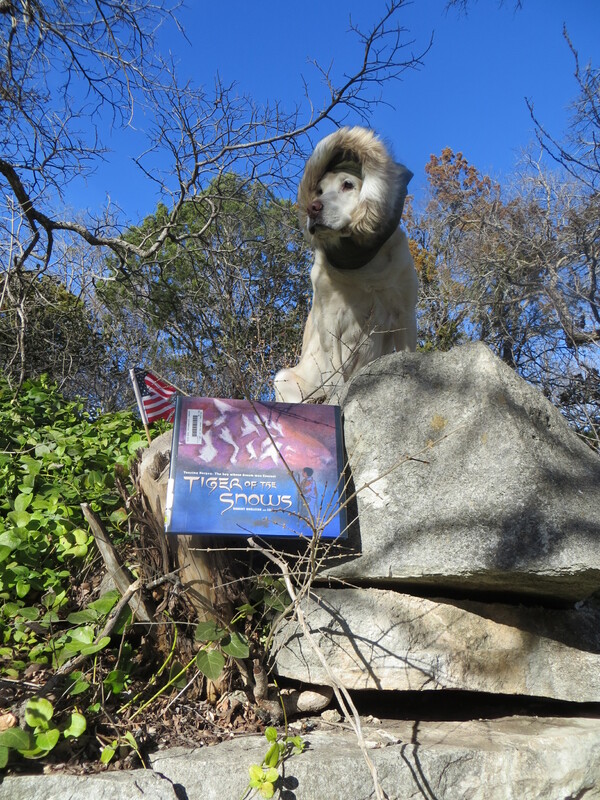 Tenzing wrote an autobiography titled Tiger of the Snows. And there has been much written about Edmund Hillary. His son Peter has a website and links for kids with lots of good info about his father and Tenzing and Mt Everest. You can check it out HERE. In 2002 Peter Hillary and Jamling Tenzing Norgay followed their fathers footsteps up Mt Everest. National Geographic made a film of this effort. Here is a clip from the video. Mountain climbing, and climbing Mt Everest in particular, has become an extremely popular adventure experience. There seems to be constant traffic these days going up and down the mountain. A discussion about the impact of all this traffic on the mountain itself and the surrounding communities would be a good thing to have. 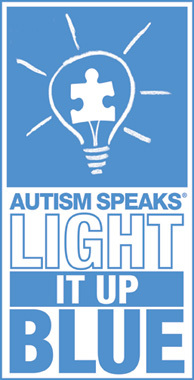 An interesting article on this topic can be found HERE. And NPR had a nice story HERE. 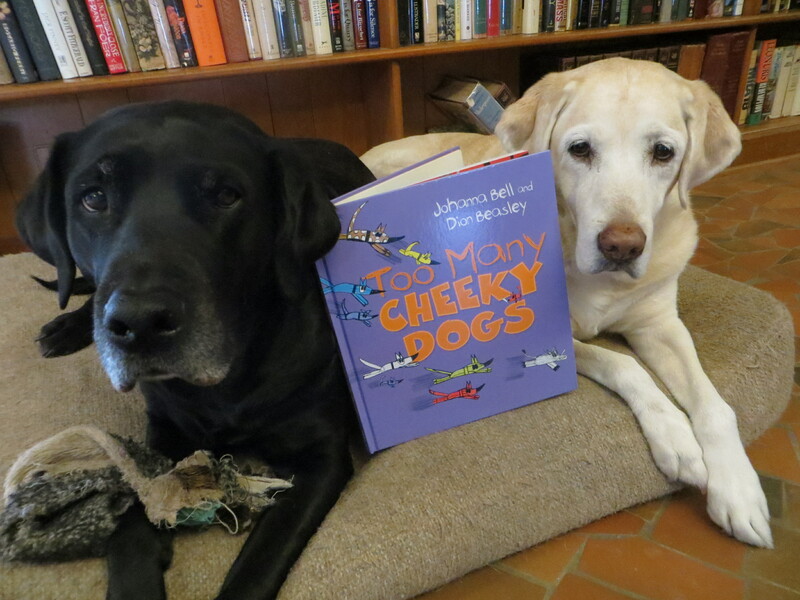 For more Perfect Picture Books and great resources to go along with, please visit Susanna Hill’s blog. Happy climbing to you! May you reach your dreams! I have heard that some parts of the country are experiencing more of that stuff called snow. I hear that in some places it is really BIG snow and really BIG cold. Not here. It’s COLD. Really Cold! But no snow for us. This is a rather old book published in 1948 by E.M. Hale and Company (by arrangement with The MacMillan Co.) There are newer versions of this book to be found. We found this really lovely, old copy at our library. It was written and illustrated by husband and wife, Berta and Elmer Hader, and describes the big blizzard of December, 1946. (the book says 1946, research tells me that it was Christmas of 1947.) The book was awarded the Caldecott Medal in 1949. The theme of the Big Snow would be Snow! and winter and wildlife survival in winter. It’s suitable for age 5 and up. It is an old book, but it is pertinent to current times. It’s basically a nature book. It begins – “Honk-honk-honk.” “The wild geese were flying south.” Mrs. Cottontail and the littlest rabbit watched them from the vegetable garden. She tells the little rabbit that he must eat plenty of cabbage leaves and carrot tops so that he will have a thick coat for winter. We see all the other animals watching the geese fly by and learn how they will get through the winter. The ground hog and the skunks and raccoons will all take long naps in dark dens. All of the other birds – the cardinals and sparrows and jays and pheasants – believe that they will be able to find plenty of seeds and be just fine through the cold weather. The chipmunks and squirrels and mice have stored nuts and seeds away. The deer are comfortable in their woods. All of the animals thought that they were ready for winter. Then it began to snow. And it snowed and snowed. The snow was deep and thick and covered everything. The animals discovered that it was not going to be so easy to find food in all that snow. But the jay saw an old man and an old lady putting out seed and nuts and bread crumbs and hay. The jay called out to all the other animals on the hill. Everyone passed the word along that there was food at the little stone house and they all made their way to the feast. In the end, the ground hog saw his shadow and hurried back to his den to wait out the rest of the long cold winter. HERE is a link to Life Magazine photos of New York City in the snow – 1947. If you do have snow where you are it would be fun to just go out and walk in the snow. Scatter some seeds and bread crumbs for the birds. HERE are some instructions for making pine cone bird feeders. Rubber Boots and Elf Shoes has directions for a fun “Winter Calming Jar” filled with sparkly floating glitter. And of course there’s always snow ice cream!! I’ve never had any myself. I just eat my snow plain. When I can get it. 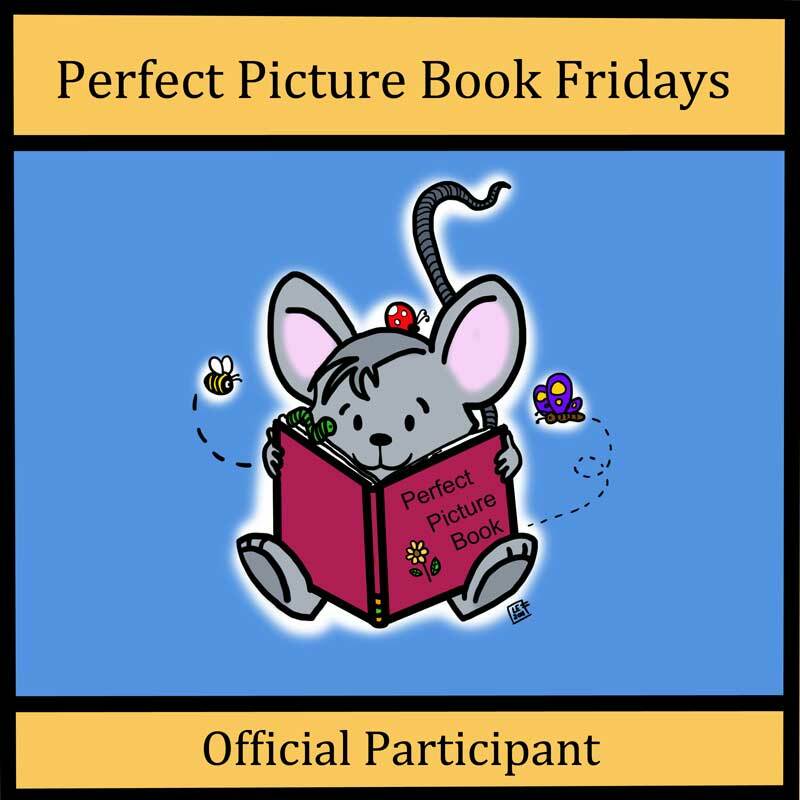 And of course on this bitter cold Friday, while you’re nice and warm at your computer, you might want to venture over to Susanna Hill’s blog to find more Perfect Picture Books and some great resources to go with them. It seems that I spend a lot of my time waiting. Waiting can be very difficult. Sometimes I get very impatient. Sometimes it’s hard to get anyone to understand what it is that I want. I find that some people can “hear” me better than others. Some of the little kids at school try to do things for me whether I want it or not. They bring me things that I don’t know what to do with. Like cars and trucks. Or dolls. Or their shoes. Or they try to wrap me up when they think I’m cold. Or they feed me stuff. I like when they do that! But the Mom Person doesn’t so much. I usually just sigh and wait for them to decide to take me for a walk or read me a book or feed me something without the Mom Person seeing. 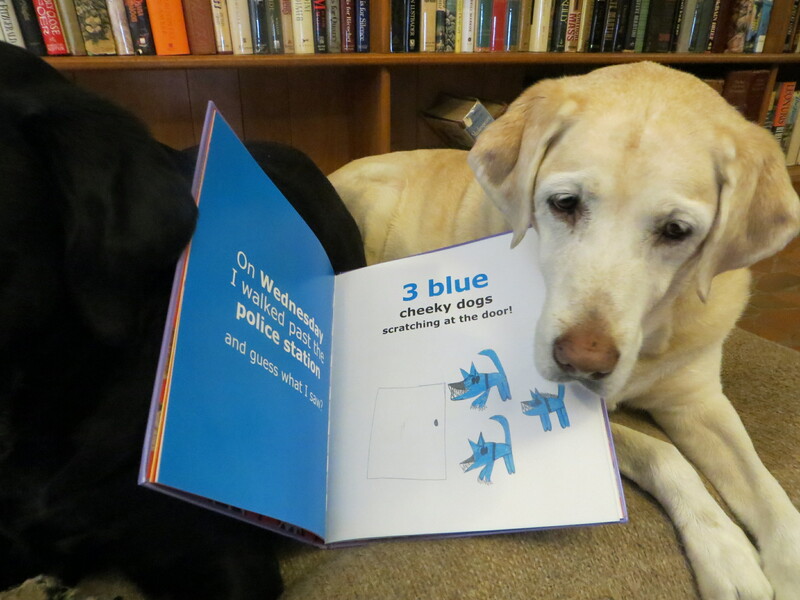 We have a funny little book on our bookshelves about waiting. He Was There From the Day We Moved In. Story by Rhoda Levine. Drawings by Edward Gorey. This is a New York Review Book published in 2012. The book was originally published in 1968! It begins – “He was there from the day we moved in. He was there sitting in the garden.” “He” is a rather large sheepdog. The family can’t figure out why he’s there. 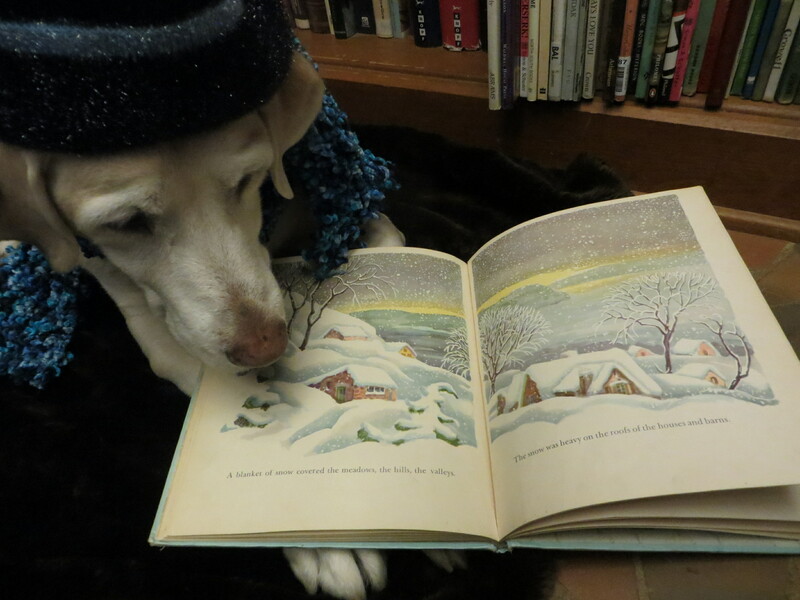 The narrator, a boy of maybe 9 or 10, thinks the dog is waiting for something. 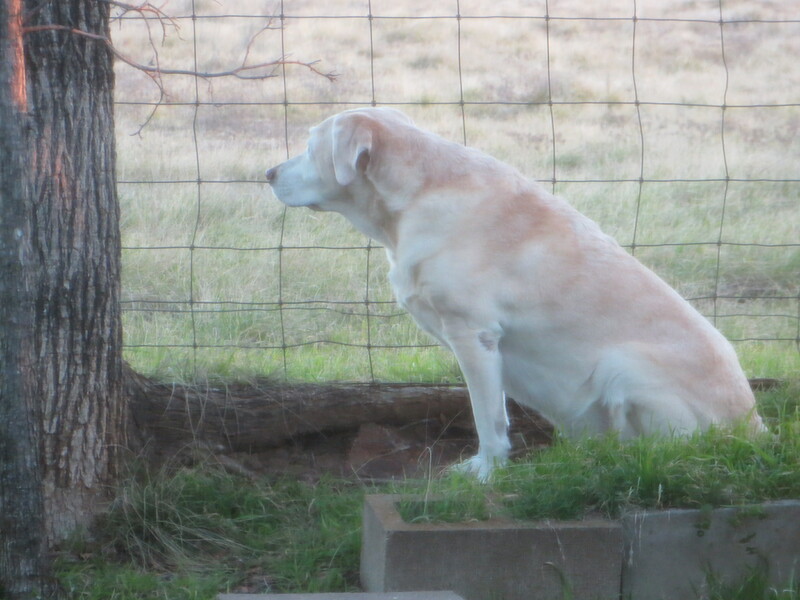 The little brother, 4 yr old Ogdon, is determined to find what the dog is waiting for. He jumps up and down and turns somersaults. The Mother thinks he’s waiting for something to eat and brings him an assortment of food choices. 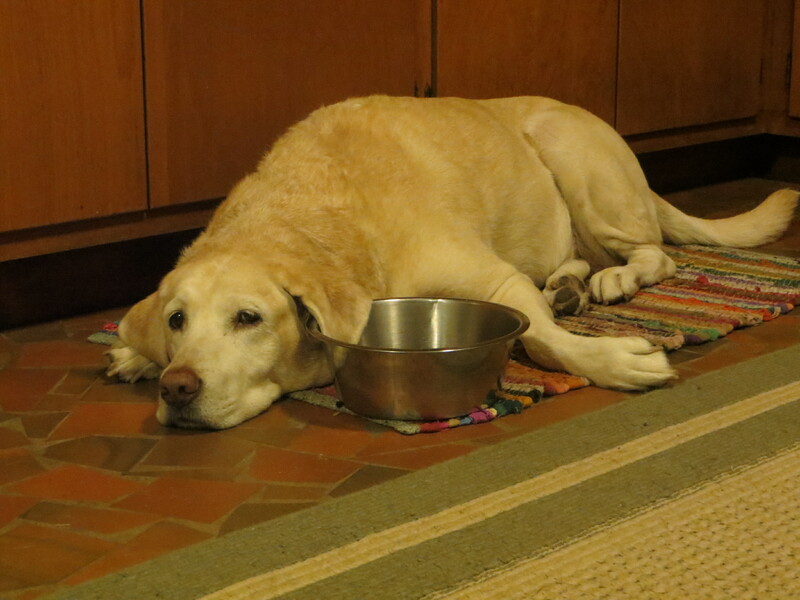 The dog eats, but continues to wait. He waits in the rain, refusing to come in. When it gets cold, they cover him up. 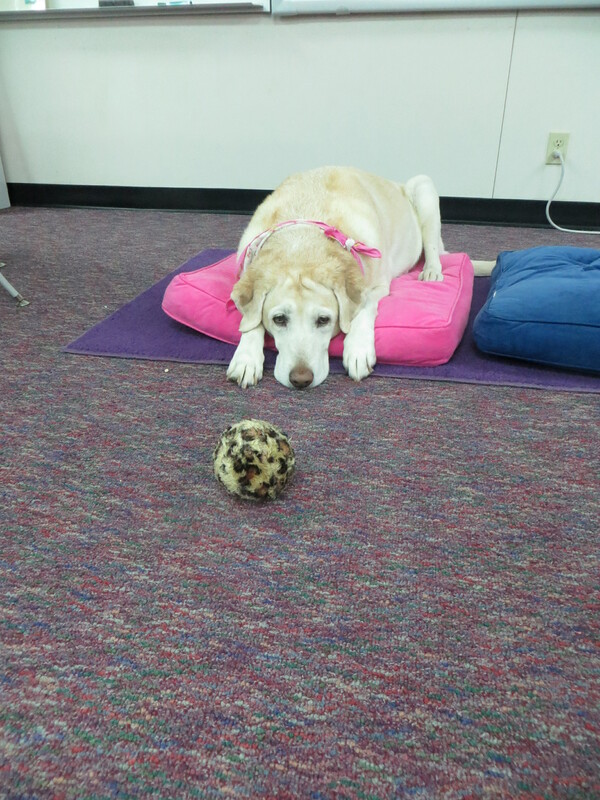 Ogdon continues to bring the dog things – string, a stray cat, crayons and a calendar. One day he just sat and talked to the dog. 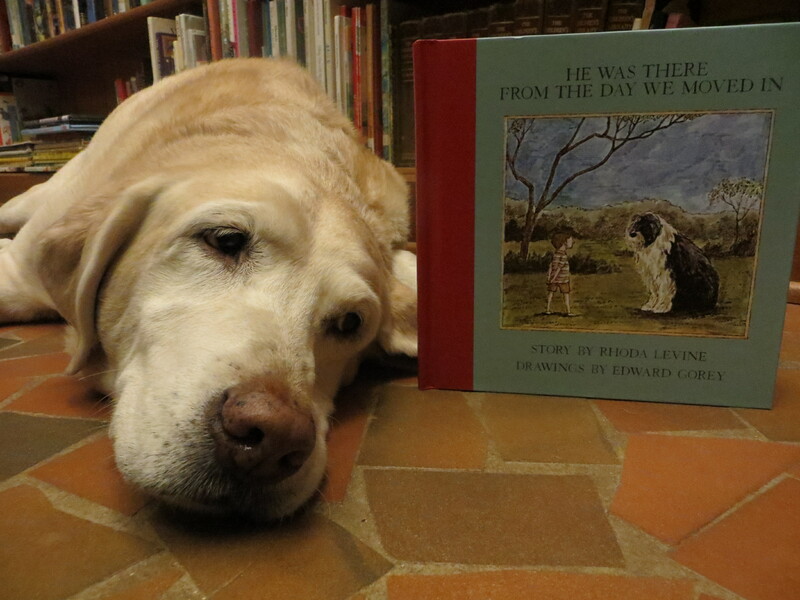 After some time, the narrator boy decides that the dog is waiting for a NAME! He decides he must think of the perfect name and starts making a list. Now I’ve previously pondered over names and what they mean. What makes for a perfect name? That is the big question. Ogdon thinks he knows the perfect name and whispers it in the dog’s ear. But the dog gets up and walks away! Ogdon had called the dog Marilyn! The big brother runs after the dog and pleads with him to give them another chance. Please, be a good friend and be patient! So the dog stays. And he’s still sitting and waiting. An odd ending. A not very satisfying ending. A strange, quirky tale. Names. They can be uplifting or they can create a nightmare. I’m hoping they will find the right name for the poor dog before too long. A hard situation for everyone. In spite of the lack of a real ending, I like this book. 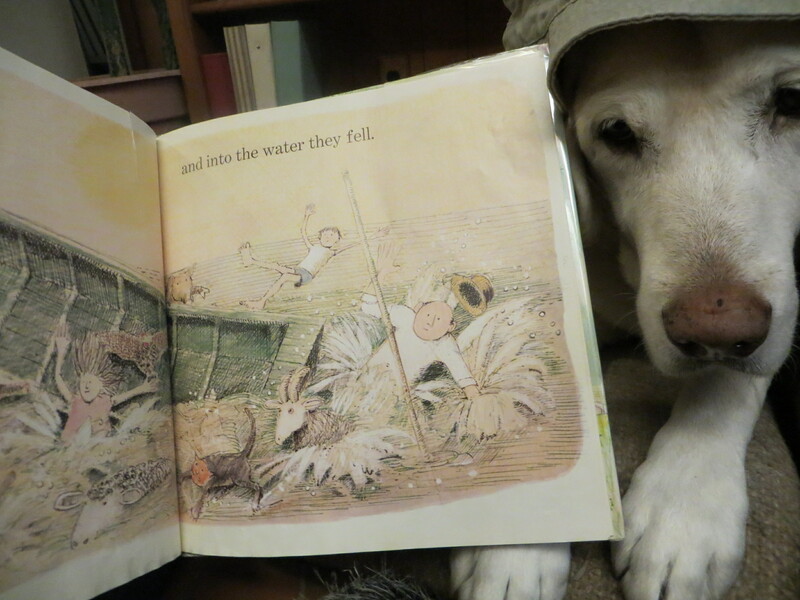 It is a very humorous tale, with the dog a permanent fixture in the yard and Odgon trying so hard to get a reaction from him. I like Mr Gorey’s illustrations. I like Ogdon’s enthusiasm. He reminds me of the kids at school. I like the big brother’s persistence. And I guess in the end, the reader is left to come up with a personally satisfying name for the dog that will tie everything up nicely. If you happen to be in Maine, you might like to visit Mr Gorey’s house! Check the website HERE. Ms Dina at The World According to Dina recently had a lovely post about Waiting as well. You might want to check it out HERE. May your waits be short and sweet! To continue the thread I had going about names, I came across a great little book at the library the other day. It’s really a song performed by one of my favorite musical duos, Trout Fishing in America. And now I find that the song has become a book! My Name is Chicken Joe, songs by Trout Fishing in America – (Ezra Idlet and Keith Grimwood). Illustrated by Stephane Jorisch. A storybook CD published by Folle Avoine Productions in 2009. The title song, Chicken Joe is about unlikely names. What do names really mean? 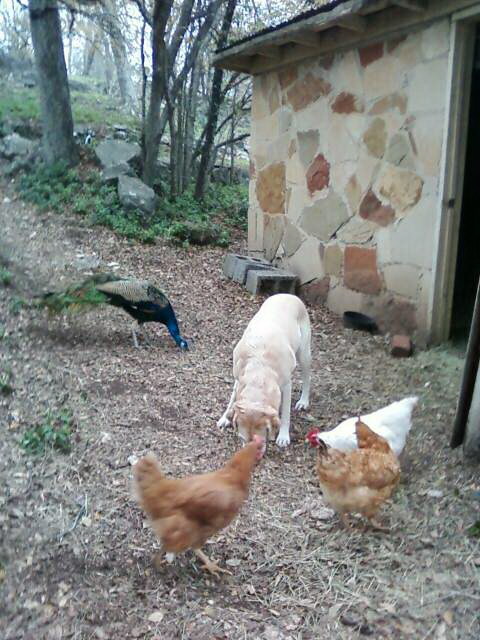 Chicken Joe is a cat who sleeps with the chickens when the weather gets cold. He’s not a chicken, just a cat named Chicken Joe. I never sleep with our chickens, but I sometimes dine with them. Next comes a dog named Miss Kitty who lives in a big city. Then there’s a parakeet named King Kong who has quite a temper, and a mule named Mister. So, do names define who we are? Do we become our names? What do others see when they hear our names? Are you happy with the name that you have? Or do you dream of something more or less exotic? 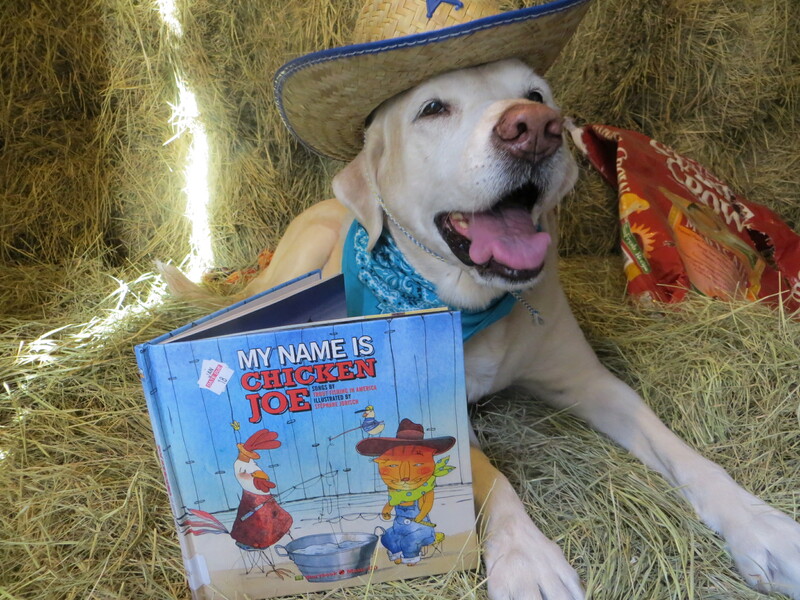 This book, My Name is Chicken Joe, is a storybook CD, which means that it comes with a CD with lots of songs on it. And the other song lyrics are included in the book. The illustrations are a little quirky, just like Trout Fishing in America. They fit quite nicely with the songs. That Chicken Joe is a pretty cool cat! You can find out more about Trout Fishing in America at their website HERE. I don’t have three names. I have one name. One tail-wagging name. Rhythm. Makes my tail wag anyway, when I hear it. Rhythm. A catchy name. 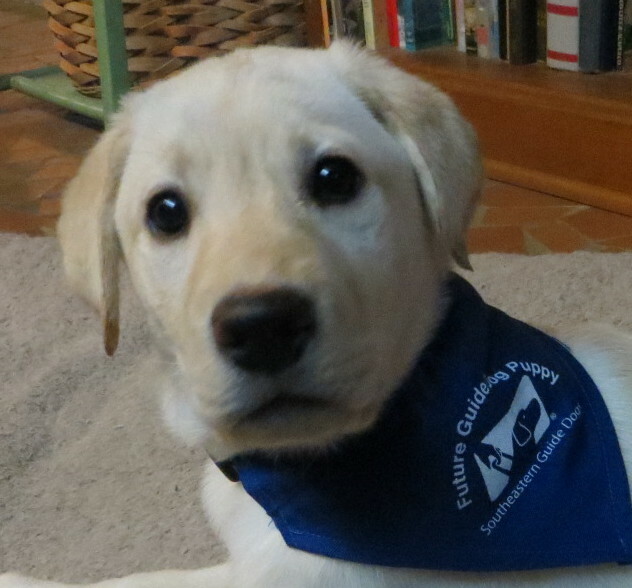 My name came from my puppy obedience trainer. I was named in memory of her favorite German Shepherd Dog. I guess there’s some meaning somewhere in that. I guess I’m carrying on some kind of legacy. 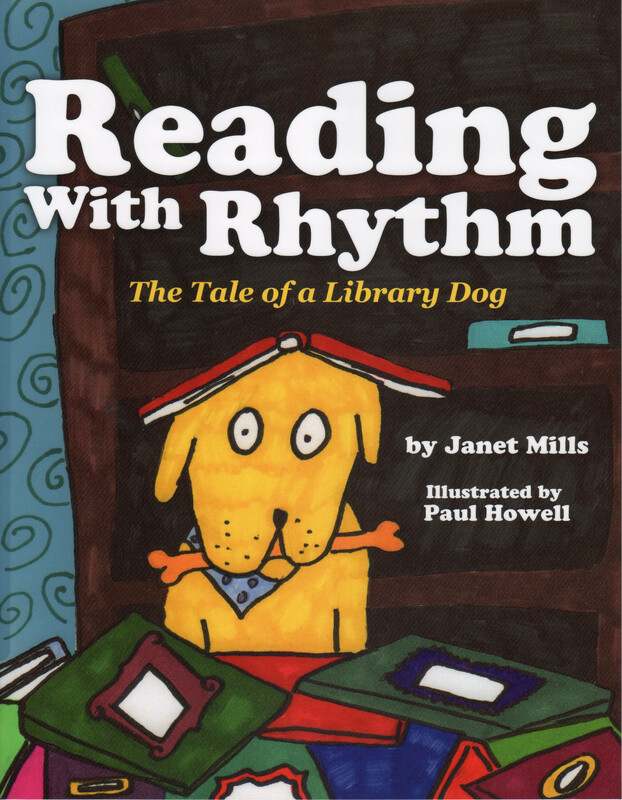 And the legacy continues, because quite a few kids in Glen Rose have named their dogs Rhythm. I guess there’s some meaning in that as well. Names do carry a lot of meaning. I don’t know about Human names, but all of my canine friends have names that fit them pretty well. Walker can’t sit still. His favorite job is walking the halls. 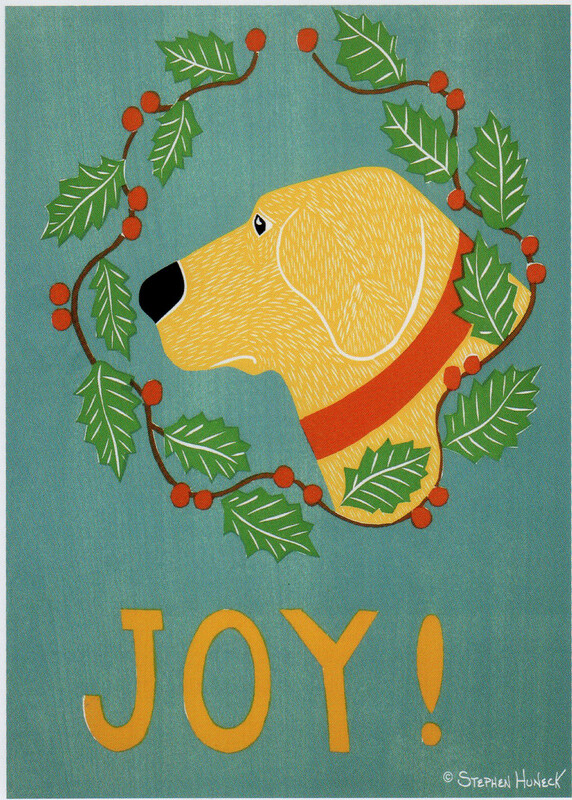 Jolly ALWAYS has a smile and a wagging tail. Jazz is a crazy, happy girl. Hank was a good ole boy and superstar ball player. Now, here’s the thing — Do we become what our name ordains? 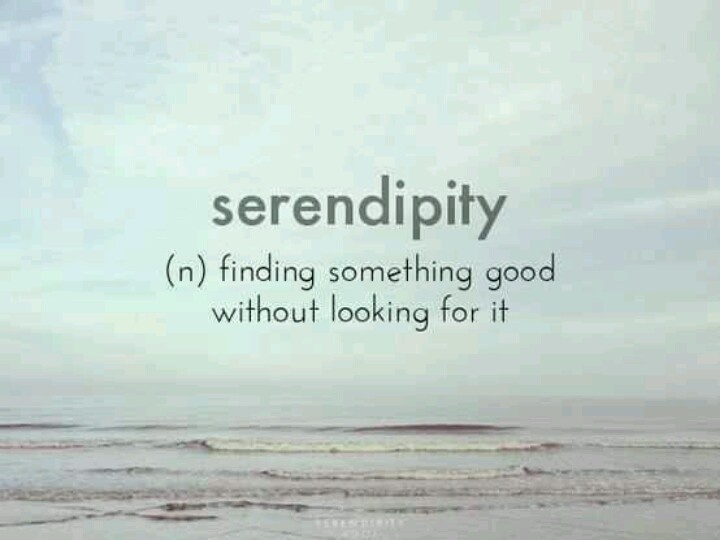 Or are we SERENDIPITOUSLY given the name we need? I don’t know the answer to that, but I ponder it a lot. Now all of this rambling about names leads me to my PPBF pick for the week. 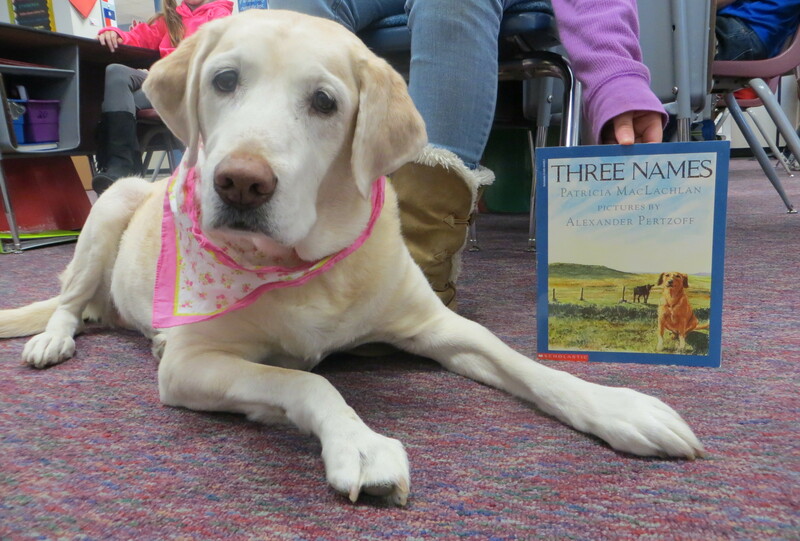 A book about a dog with Three Names. Three Names was written by Patricia MacLachlan and illustrated by Alexander Pertzoff. Published originally by Harper Collins in 1991 and then by Scholastic in 1994. Suitable for ages 5-9. I think that older kids would enjoy this one as well. This is a fictional memoir about life on the prairie “back in the day” a hundred years ago or so. It begins, “When my great-grandfather was young – a hundred years ago, he likes to say, but that’s not true — he went to school on prairie roads in a wagon pulled by horses.” This is Great-grandfather’s tale of a year in a one room school house. When Great-grandfather went to school in that wagon, his dog went, too. 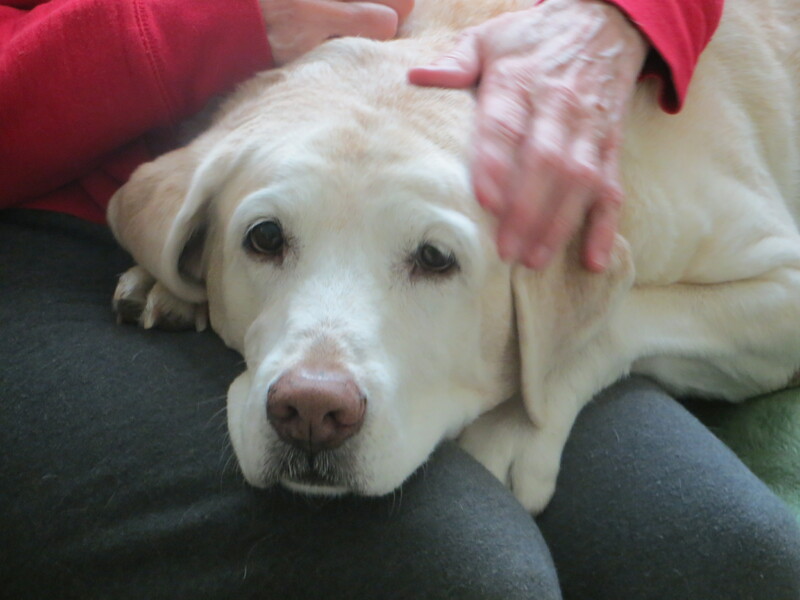 Great-grandfather called the dog Three Names, because everyone in the family had a different name for him. Lily called him Ted, Mama called him Boots, and Papa called him Pal. Three Names loved going to school. And he was welcomed as one of the class. 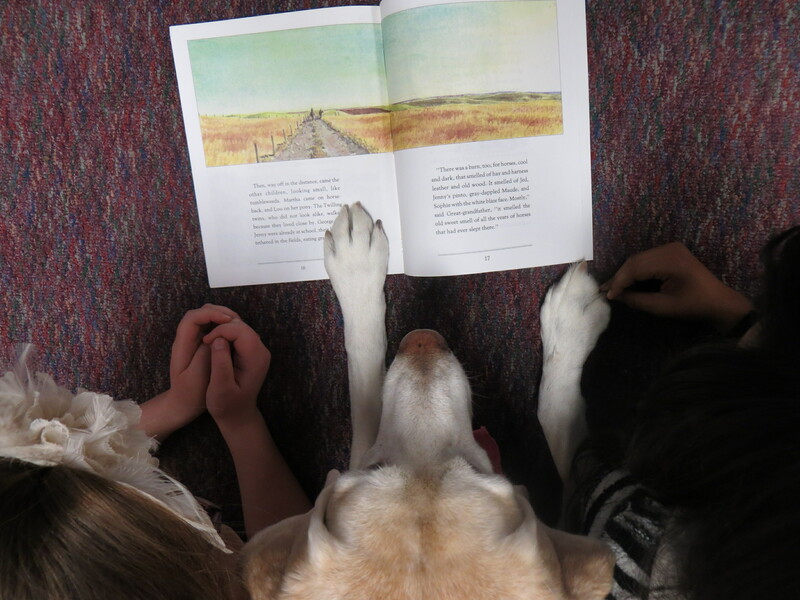 This story is about a dog named Three Names who went to school, but it’s also about the beauty and magic of the prairie and about life in a one room school house. The bigger kids took care of the smaller ones. They all were kind of a big family. Summer on the prairie was a fine time, but the kids and Three Names missed school. Every day Three Names would prance and dance around the wagon wanting to go down the prairie road. But he would soon sigh and settle down next to Great-grandfather and the two of them would dream about school. This is a beautifully poetic book. Ms MacLachlan has an incredible knack for putting the reader in her “place.” I felt like I was riding along in that wagon, down the dirt road with the sun beaming down and the wind blowing my ears. This book would provide great fodder for a discussion of “place” in stories. The watercolor illustrations by Mr Pertzoff are a perfect accompaniment to Ms MacLachlan’s words. Soft and breezy. Unfortunately I could find very little about Mr Pertzoff. He was an avid naturalist and died of cancer in 1995 at the age of 56. A sad loss. Patricia MacLachlan grew up on the prairie and knows it with her heart. She has written several books about that “place” that is home for her, namely, Sarah, Plain and Tall. You can find out more about her HERE. An interesting article about Ms MacLachlan’s father Philo Pritzkau HERE. Scholastic has a lesson plan for Three Names HERE. And suggestions for discussion groups HERE. 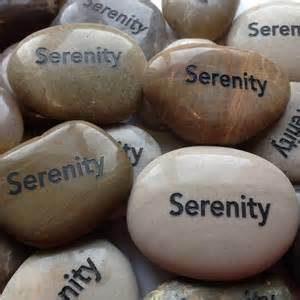 If you would like to look into the meaning of your name check out Behind the Name. 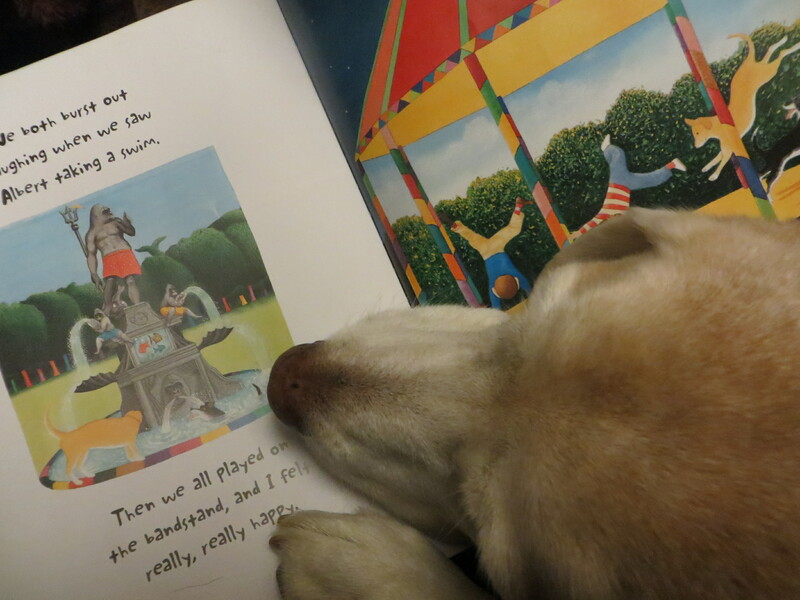 For more Perfect Picture Books and resources to go with, visit Susanna Hill HERE. What does your name say about you? What “place” holds your heart? I send a wag and a smile and a dance out your way – from the 7 Acre Wood, the place that holds my heart! Parks are wonderful places. 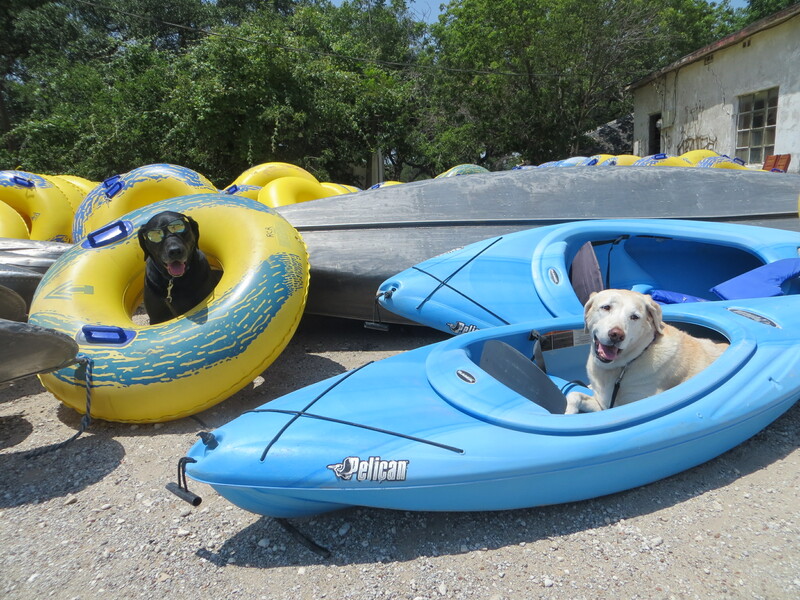 We have some parks in Glen Rose that we visit sometimes. No dog parks, but dogs are allowed at the parks. One of the parks is kind of a historical place. There are buildings there from hundreds of years ago. This park is by the river and there is a nice walkway that meanders along beside the water. There is a playground and picnic tables and benches – places to let some wildness out or just to sit and contemplate. Another park is the soccer park. All the soccer fields are there and it can be a pretty busy place. There is also a playground for the kids and a track that meanders around the whole park for walkers and joggers. We go here often to walk with friends. This park is next to a big place where they have horse shows and rodeos and dog shows, so there are always interesting smells and sounds. Parks are great places for all kinds of activities – running and playing, meeting up with friends, making new friends, having picnics, enjoying nature, reading a book or just enjoying some quiet moments all to yourself. This is an incredible book on so many levels. It’s a story about how differently people see the world around them. It’s about how things may look one way on the outside, but be very different on the inside. It is the story of a day at the park from four different points of view. It begins with the Mother, an upper class, snobby gorilla lady who decides to take her son, Charles and their pedigree Labrador, Victoria to the park. She is not happy about anything at the park. Victoria is chased by a scruffy mongrel. There are frightful types in the park, and Charles disappears. She sees him talking to a rough looking child and orders him to come back to her. They walk home in silence. There are no smiles. 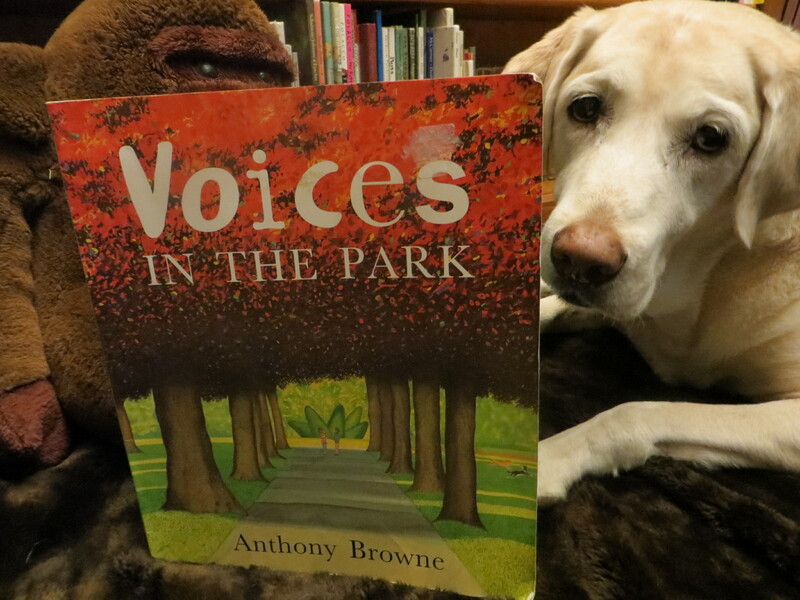 The Second voice belongs to a Father who decides to take his child, Smudge and their dog to the park. He spends his time sitting on the bench with the grumpy Mother looking through the newspaper for a job. Smudge is happy, the dog is happy, they all enjoy their time at the park and chatter together all the way home. The Third voice is that of Charles. He seems a shy, reluctant boy but makes a new friend in Smudge. He hopes that she will be there the next time he goes. The Fourth voice is that of Smudge. Smudge is the essence of joy. In all of the illustrations, you see all the other characters and how they interact in the story. The two dogs are having a grand ole time running and chasing each other. The kids have a grand ole time playing together. But there is so much more going on in the pictures! When the Mother is shouting for Charles, the trees are shouting too. When the Father and Smudge are walking to the park, their neighborhood is dark and dreary with homeless people on the sidewalk. When they walk home there are cheery lights in the trees and buildings and the homeless people are dancing. In one picture of Smudge and Charles sitting on a park bench, Charles’s half of the picture is dark and dreary and Smudge’s half is sunny and bright. Each voice is also presented in a different font. The Mother’s is a rather formal font, The Father’s is big and bold. Charles’s font is thin and almost invisible. The font for Smudge is happy-go-lucky. Mr Browne is an absolute genius! We read this book with some 4th graders and they were mesmerized – searching for all the little subtleties in the pictures. A very engaging tale! I have written about Mr Browne before HERE, HERE, and HERE, if you are interested in seeing more of him. I wish for you a lovely day in the park! Keep your eyes and ears open to all around you! 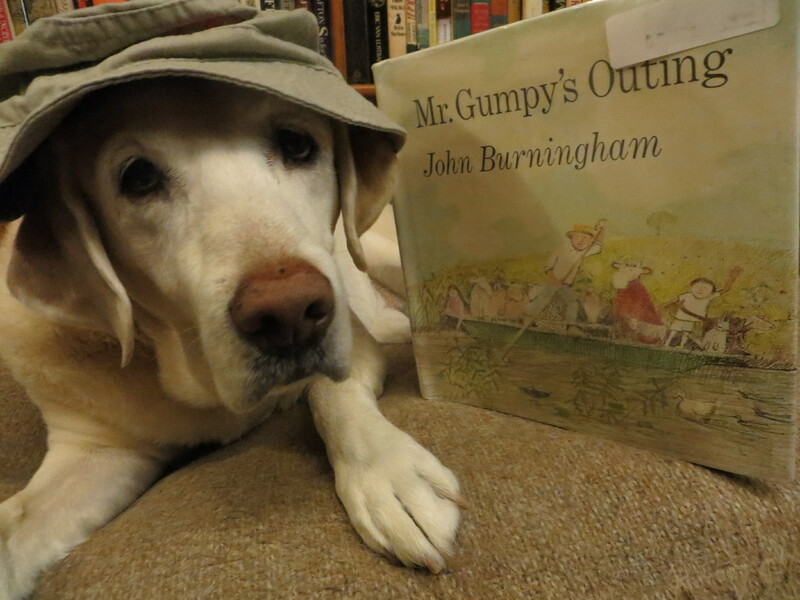 For my first entry in the Small Fry Safari Reading Challenge I bring you a book with Safariness in the title — Mr. Gumpy’s Outing by John Burningham. Published by Henry Holt & Co. in 1971. Mr. Burningham happens to be the husband of Ms Helen Oxenbury. What a truly talented pair!! Now, you may know that I have a passion for rivers — my river, the Paluxy, in particular. 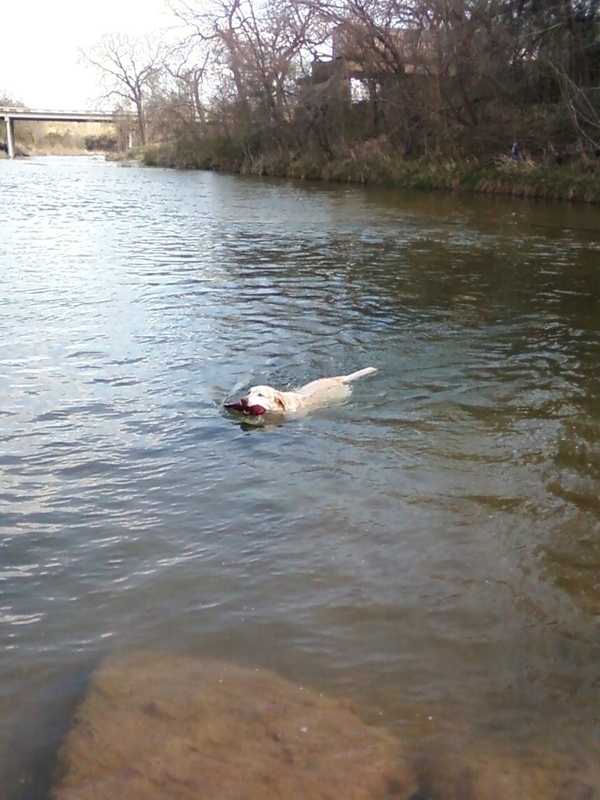 It’s the only river I’ve ever actually explored. But I figure that all rivers must be as fine as my Paluxy River. 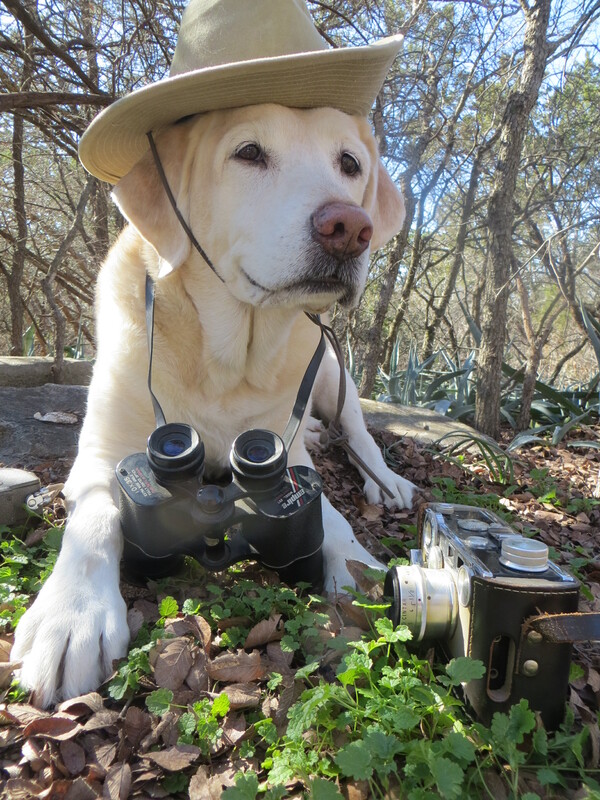 Mr. Gumpy’s Outing is about a “safari” on the river. Mr. Gumpy liked to go out on the river in his boat. One day some children asked if they could come along. Mr. Gumpy said, “Yes, if you don’t squabble.” As they floated down the river they encountered a rabbit who wanted to join them. Mr. Gumpy said ok, “but don’t hop about.” They continued to meet up with various animals who wanted to join them on their “river safari” and Mr Gumpy allowed each animal to come aboard if they promised to behave in their own way. So the traveling group grew to include a cat, a dog, a pig, a sheep, a chicken, a calf, and a goat. That was one loaded down, crowded boat!! Putting together all those different personalities in a small space is surely a recipe for diasaster! But they all traveled merrily along, until — the goat kicked. And it all went downhill from there, with each animal in turn doing that which it had promised not to do, until —- the boat tipped over and everyone fell in the river! They all swam out and lay on the river bank to dry out in the sun. Then they all walked back to Mr Gumpy’s house across the long, endless fields, and had tea. What a great lovely adventure! With a lovely ending. I surely do like Mr Gumpy! Now you may ask, ” where is the safari in a float down a river?” Well, in Swahili the word safari means a long journey. Mr Gumpy’s outing was certainly a long journey that included lots of animals. It was quite a grand journey for them all. To find out more about Mr Burningham and see a gallery of his artwork visit HERE. And a fun interview with him HERE. If you might be looking for more adventure, you might travel over to visit Gargoyle Bruce at his safari station HERE. and may you meet lots of friends along the way! I don’t watch movies too often. I usually find them a bit boring and use them as a time for cuddling and a good massage. But for Christmas I received a really fantastic movie that I would like to howl about. The Hardly Boys in Hardly Gold. 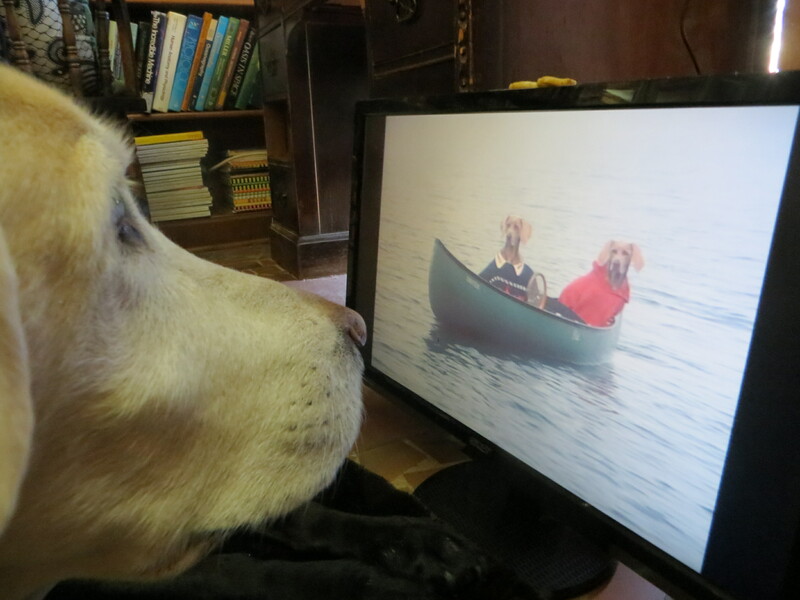 A film by William Wegman. Starring Battina, Crooky, Chundo and Fay Ray. This movie was filmed in 1995 and was an official selection of the 1996 Sundance Film Festival. It is suitable for all ages. 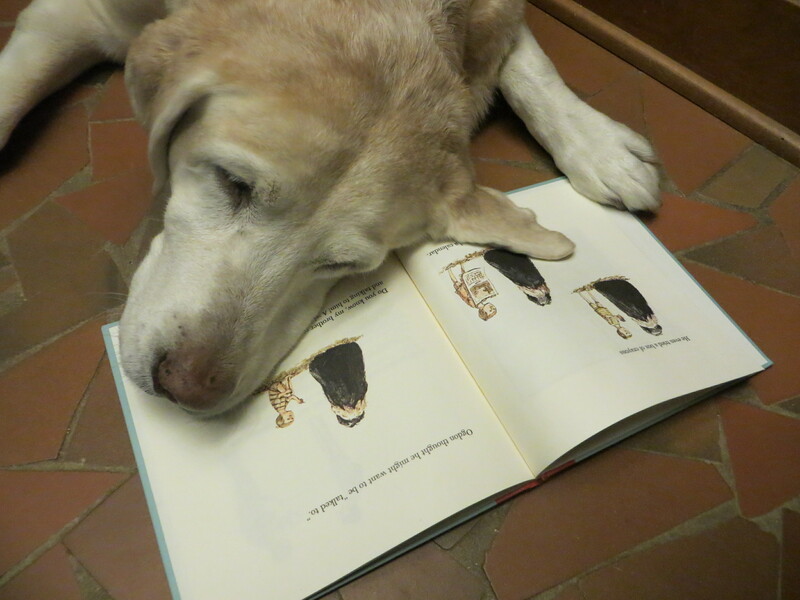 I am a BIG fan of William Wegman. Well, I’m not really all that big, but I do love Mr Wegman! He is famous for his photos of his weimaraners. I have lots of his books and a couple of other films that he has done. 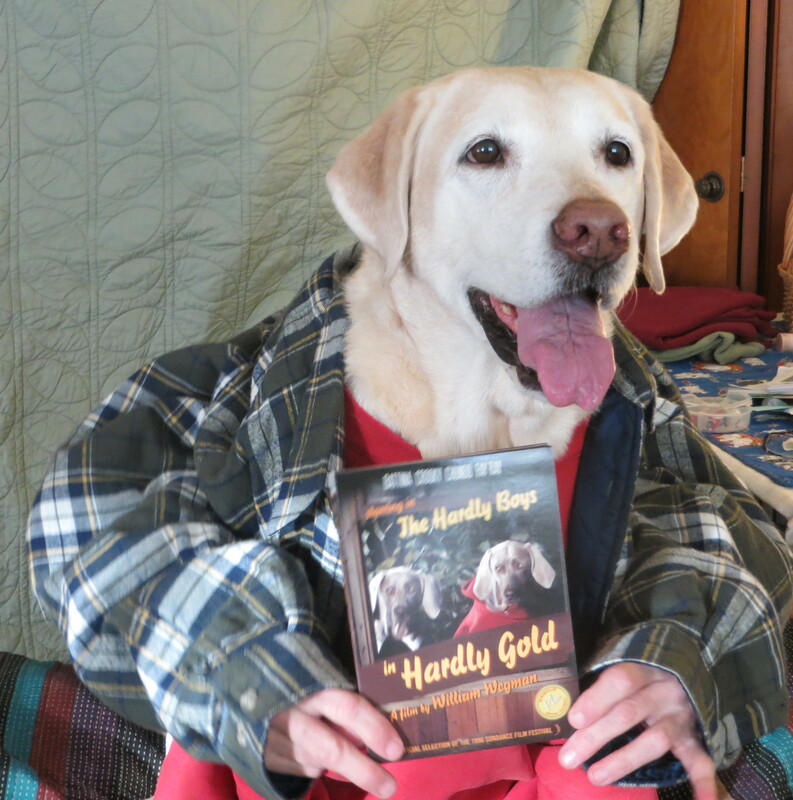 The Hardly Boys in Hardly Gold is about amateur detectives, the Hardly boys, who are spending their summer vacation, as they do every summer, at the Hardly Inn in Maine. Their Dad likes to fish, Mom likes to play golf, and the boys have a secret clubhouse where they watch movies of the Rangeley Lakes area of Maine, and do some sleuthing. In this adventure they happen upon a sinister plot by an evil nurse and caretaker to take over a local garnet mine and ruin the town’s water supply. Tension runs high as they search out clues and unravel the mystery. There is some incredible acting by all the stars. It had me on the edge of my seat! I highly recommend this flick!! You can find it on Netflix or on Amazon Prime. 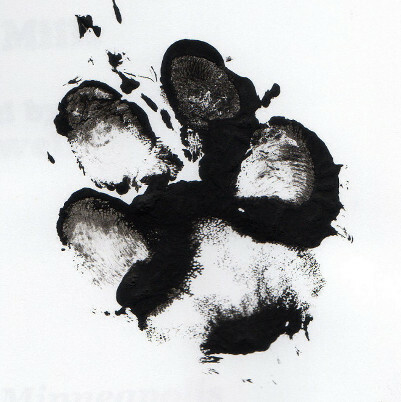 4 Paws up for this one!! Well, I’ve wrapped up 2013 and tucked it away. Now it’s time to move on down the trail. I’m going on Safari with Bruce the Gargoyle over at The Bookshelf Gargoyle. 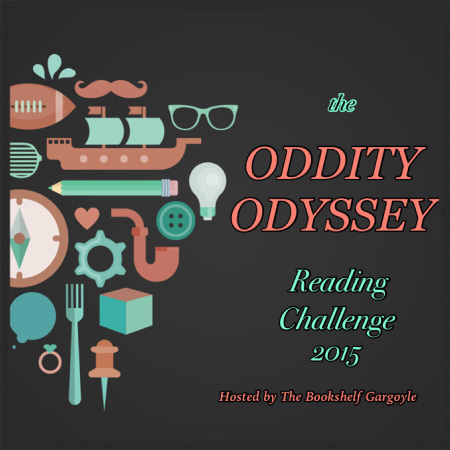 Bruce is hosting the Small Fry Safari Kid Lit Readers Challenge. And I have taken up the gauntlet. Click on that blue link to get all the scoop about this one. I think it’s going to be a fun piece of cake! So I am now off to tackle the jungle of the library! Wish me luck! And feel free to join in!